Please note that you will be able to see the video of BELLA HOME and it's amazing pool salt water, once you click the last photo on the advert. BELLA HOME has 3 bedrooms where can sleep 10 persons. 3 Bedrooms: 1 Double bed (2 places), 1 room with 1 Double bed OR 2 single beds, 1 room with 2 single beds and 2 bunk beds . Bedding : 2 Double beds (2 places), 2 bunk beds, 2 single beds. Sea : 2.5 km / 7125 ft.
Pebbly beach nearby, Sandy beach nearby, Rocky beach nearby. BELLA HOME is a splendid apartment in villa with pool salt water and natural chlorine (NO CHEMICALS), close to the sea and to very famous archaeological sites: Greek temple and amphitheatre of Segesta (20 minutes), antique roman town of Selinunte (40 minutes), archaeological site and gorgeus museum of Mozia and Marsala (40 minutes), XI Century splendid Norman and Arab monuments of Palermo, XI Century golden mosaics Norman Cathedral of Monreale. Greek Temple Valley of Agrigento. Live this atmosphere enjoying your staying in a new villa surrounded by pine trees, private garage, very large garden (s.m. 3000),showed price is referred to 10 persons. Winter time: heating extracharge (low cost). My wish is that you enjoy the swimming pool and its fantastic salt water. 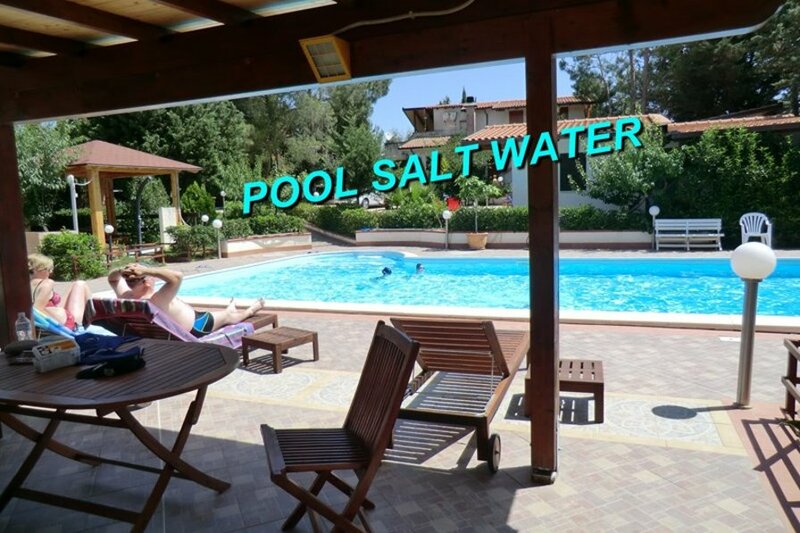 The following rules are given by the fact that the pool that you will be using has a special high technology system (Electrolysis System) producing NATURAL CHLORE straight from salt-water and constantly controlling the degree of water PH. By this, to put the system in conditions to produce the best quality water and to give you the opportunity to get the most pleasant swim, totally exempt by any irritation on eyes, lips and nose that only the Natural Chlorine can offer you, I kindly ask you to observe the following rules. Thank you. - PLEASE, WEAR YOUR POOL-CAP; FOR BOYS/MEN, SWIMMING TRUNKS TO BE WORN IN THE POOL. LONG SHORTS (i.e. SURFER SHORTS) NOT PERMITTED. . THE POOL IS OPEN FROM 9 A.M. TO 1,00 P.M. AND FROM 5,00 P.M TO 8,00 P.M.
Sicily has a Mediterranean climate. Summers are hot and dry, with July and August highs of 30C (86F). Winters are mild, with temperatures between 10C and 20C (50F-68F). For those who dont like it too hot, the best time is late spring and early summer. PALERMO: Sicilys principal city is ideal for culture vultures looking for an alternative Italian city break holiday, it has some of the most amazing monuments in Italy, and perhaps in the world. It is also the main centre of Norman architecture in Europe. And is ideal for sun-seekers looking for a Med beach break with a bit of a twist.